One evening in the 50s - or so - in a small Café Chantant-Variety frequented by singing enthusiasts, a gallery of solitary hearts parades .... they are all looking for a simple, but great and powerful desire .. . In their variety they represent different but eternal ways of the relationship between woman and man ... and, in the intertwining of alternating love affairs, they are "all in the same boat": ... life! Each of them - through songs of different eras and atmospheres - tells a part ... of his, that of others, that of all of us ... "after all, we are all looking for a kiss", no? ! That's why we're here tonight and you're here, excited customers of this little coffee, cheerful, poignant, even a little "magic". You will see each other again ... and you will love those who suffer from a contrasted history, those who do not see love that passes or are afraid to love, those who lose themselves for an old hidden wound, those who frown for unrequited love and cry out to the world those who protect and guide with maternal vision, those who feel alone but go beyond - still believing, or playing and smiling. ... and to Poetry, which dwells in the Universe for those who can see and hear it. 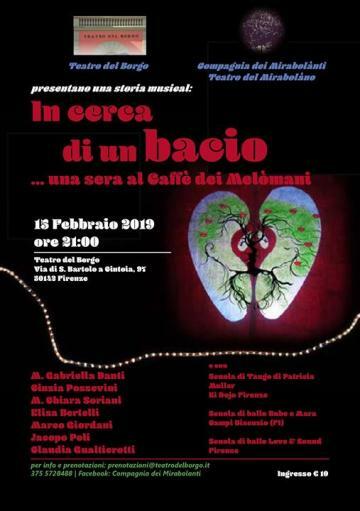 Ladies and Gentlemen, be welcome to the Caffè dei Melòmani !! !